Roeder Manipulative Aptitude Test measures hand, arm, finger dexterity, and speed. It is designed to test individuals for employment and to test elementary through college students when dexterity is a primary requirement. 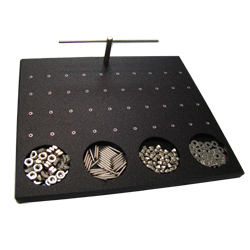 The board has four receptacles for holding washers, rods, caps, and nuts.The performance board also is comprised of a horizontal T-bar and 40 inserts arranged in a predetermined pattern. Replacement Pins and Caps for the Roeder Manipulative Aptitude Test, Model 32026. Set of 50 Record Blanks for the Roeder Manipulative Aptitude Test, Model 32026.